“Recreational User” means any person (1) with a big game permit for a hunt area that includes the Subject Property; (1A) any person with a prairie dog permit for Aubrey Valley (2) any person scouting for a big game hunt that includes the Subject Property, (3) a guide as defined in A.R.S. § 17-101 and who is assisting a person with a big game permit, (4) any person assisting or accompanying a person with a big game permit for a hunt area that includes the Subject Property and (5) any other person participating in an mutually agreed upon activity that includes the Subject Property. *** Recreational Users who are assisting or accompanying a person with a big game permit for a hunt area that includes the Subject Property must know and provide the name of the person that they are assisting and the hunt that they are assisting on. Recreational Users must pay the Recreational Impact Fee for all big game hunts, to obtain a separate Ranch Access Permit for each hunt. See “Hunt Access Rates Page” for permit cost. Recreational users shall use the Big Boquillas Hunting website to obtain the Ranch Access Permit. The Ranch Access Permit will be valid beginning the first Friday in August. This permit includes the Big Boquillas Ranch within Game Management Unit 10 and will expire at midnight on second day after the conclusion of the hunt associated with Ranch Access Permit. Note: Guides and outfitters, please refer to Ranch Rules 7 and 8 below. Recreational Users who are prairie dog hunting only must pay the Recreational Impact Fee of $20 per day per person using the Big Boquillas Hunting website. Multiple days may be purchased and listed on one permit. This Ranch Access Permit will be available based on Arizona Game and Fish Department’s regulation pertaining to prairie dog season start and end dates. This permit is valid for the Aubrey Valley portion of the Big Boquillas Ranch within Game Management Unit 10. Prairie dog hunters must remain in the grassland portion of the Aubrey Valley and are not permitted to access other areas of the Ranch including the Aubrey Cliffs and Robber’s Roost. Any further restrictions regarding Aubrey Valley pastures will be made available at the time of purchase. Prairie dog hunting is not allowed within one mile of Pica Camp in Aubrey Valley. Recreational Users who are antlerless elk hunting only must pay the Recreational Impact Fee of $50 and obtain a separate Ranch Access Permit for each hunt. A Recreational User shall use the Big Boquillas Hunting website to obtain a Ranch Access Permit. The Ranch Access Permit will be valid beginning the first Friday in August. This permit includes the Big Boquillas Ranch within Game Management Unit 10 and will expire at midnight on second day after the conclusion of the hunt associated with Ranch Access Permit. Youth hunters (17 years old and under at the time of entry) and one mentor who assists the youth hunter. Junior hunters who are participating in a Department sanctioned juniors-only big game hunt and all others assisting with that hunt during the hunt dates. Youth, 15 years old and under, who are assisting or accompanying a person that is prairie dog hunting or possesses a big game permit for a hunt area that includes the Subject Property. One complimentary Hunter Assist Permit is available for each antlerless elk Hunter Permit that is purchased. See the “Notices Page” section for more details. Those Recreational Users for whom the Lessee and Department agree to waive access fees. Individuals exempted from paying the Recreational Impact Fee must contact the Lessee’s Hunt Manager to obtain a no-cost Ranch Access Permit. Recreational Users who intend to enter and remain on the Boquillas Ranch must sign in at one of the designated access points. All Recreational Users who enter and remain on the Big Boquillas Ranch must at all times possess a valid Ranch Access Permit. Permits are available by purchasing the Permit online at the Big Boquillas Hunting website. All guides and outfitters must register with the Lessee’s Hunt Manager, pay a $500.00 Recreational Impact Fee and provide proof of licensing and insurance when operating on the Big Boquillas Ranch. Each guide and outfitter is allowed two guides per contracted hunter in the field to scout and/or hunt. Each guide and outfitter must purchase their own individual permit. Other guide and outfitter employees, such as a cook, will purchase a Ranch access Permit, but at no time will they be allowed to assist the hunter in scouting or hunting on the ranch. A guide and outfitter must have a hunter contracted for a hunt that lies within the boundaries of the Big Boquillas Ranch in order to enter the ranch to pre scout. In order to pre scout, a $500.00 Guides and Outfitters permit must be purchased. Those holding an Arizona Game and Fish Department Special Tag and their guides/assistants may access the Big Boquillas Ranch during the same time period as all other Recreational Users and must register with the Lessee’s Hunt Manager. Guides and outfitters must pay a $500.00 Recreational Impact Fee and provide proof of licensing and insurance when operating on the Big Boquillas Ranch. Guides for an Arizona Game and Fish Department Special Tag are allowed access only during the regular open access periods as other Recreational Users and Guides. The same rules apply for guides and outfitters on special tag hunts, with one exception; the special tag hunter must designate two individual guides by name for the duration of their season. This access program for permitted Recreational Users to enter and hunt the Big Boquillas Ranch will begin the first Friday in August annually. Access by Recreational Users to the Big Boquillas Ranch will close after Thursday December 19, 2019. Access after that date is prohibited on the Big Boquillas Ranch, unless otherwise expressly authorized in writing by the Lessee. Ranch Rules will apply to all private property and Arizona State Trust Land that is accessed through private property within the Big Boquillas Ranch. As a condition of lawful access, permitted Recreational Users who enter/cross private property, owned by the Boquillas Ranch, agree to abide by all Ranch Rules, even when hunting on Arizona State Trust Land. Failure to do so may result in the permanent loss of access privileges to the Boquillas Ranch and any other Ranch participating in the Landowner Compact. Those individuals who have been noticed of permanent loss of access privileges who attempt to re-enter private lands on the Boquillas Ranch may be cited for trespass. While on the Big Boquillas Ranch, a violation of any state statute or regulation or these Ranch Rules shall result in revocation of the Recreational User’s Ranch Access Pass and may result in permanent revocation of the privilege to access the Big Boquillas Ranch. This applies to all private property and Arizona State Trust Land accessed through private property within the Big Boquillas Ranch. Prior to entering the Big Boquillas Ranch, all adult Recreational Users must acknowledge in writing that the Recreational User has read and understood the Ranch Rules and agrees to abide by the Ranch Rules and accept responsibility for damage the Recreational User causes to the Big Boquillas Ranch. Each individual must keep a copy of their permit on their person at all times while on the ranch. All other access on the Big Boquillas Ranch is forbidden unless written authorization is obtained from the Lessee (No Trespassing). All vehicles must display on the dash board a copy of the permit for each individual that is associated with that vehicle. Aerial scouting is prohibited on the Big Boquillas Ranch. The use of trail cameras, scouting cameras or any other automated remote camera systems is prohibited on the Big Boquillas Ranch. The construction of or use of blinds or tree stands (commercial or otherwise) is prohibited on the Big Boquillas Ranch. Hunting within 100 yards of a water source is prohibited on the Big Boquillas Ranch. Any off-road vehicle including ATVs and UTVs are prohibited (utilized or possessed) on the Big Boquillas Ranch. An exception will be made for those holding a Champ permit. Horses, mules and donkeys (all equines) are prohibited on the Big Boquillas Ranch. 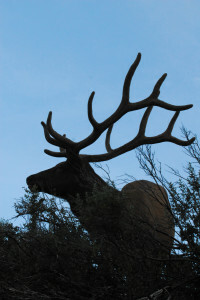 Off-road motorized big game retrieval is authorized only for the retrieval of elk on the Big Boquillas Ranch. When retrieving a harvested elk, hunters may make a single trip in and out using only one vehicle. Off-road motorized big game retrieval is not authorized when conditions are muddy. Unless otherwise permitted, all other off-road travel is prohibited on the Big Boquillas Ranch. The use of any edible substance (including salt) to attract wildlife (baiting) is prohibited on the Big Boquillas Ranch. Walk-in only hunting areas may be identified periodically throughout the year. The purpose of these areas is to assist ranch operations. Hunters can check on the status of the walk-in areas, by contacting the hunt manageror by checking the Big Boquillas Hunting website. Gates are an important management tool on the Big Boquillas Ranch. As gates are utilized on the ranch they must be left in the same condition as when they were found. Securely close gates that were closed and leave gates open that were already open. If there is any question on a gate status, contact the hunt manager or a ranch employee. Cattle have the right of way at all times. Improvements on State Trust Lands including corrals, troughs, tanks, dirt tanks, pipelines and fences are private property owned by the ranch. Respect the investments of the Ranch and preserve your privilege to hunt the Big Boquillas Ranch. All spotlighting is prohibited on the Big Boquillas Ranch. Within 200 yards of Big Boquillas Ranch residences the speed limit is 15 MPH. Discharge of a firearm is NOT Permitted within a one mile radius of the Pica Camp Headquarters. Hunters, Hunter assistant’s, Guides and Outfitters, will in no way interfere with other hunters during their hunt. Camping and extended parking is prohibited within one quarter mile of any water source.